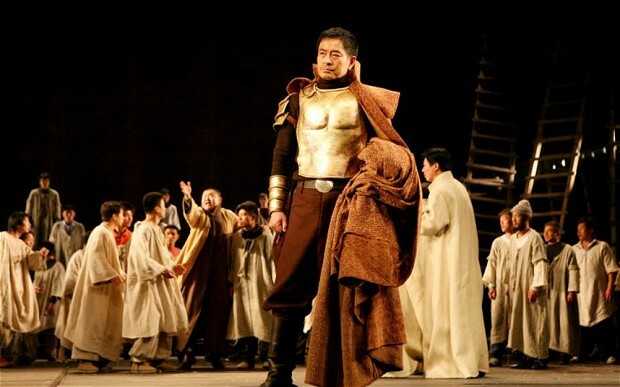 Chinese Coriolanus at the Edinburgh Festival: Play out of Context? I saw Lin Zhaohua’s remarkable post-Tiananmen Hamlet in 1995, at the Tokyo International Festival. Then, in 2011, I also saw his renderings of Ibsen’s The Master Builder and Chekhov’s Ivanov, as part of the Beijing People’s Art Theatre’s ‘Lin Zhaohua Festival’. All starred his long term collaborator, the veteran actor Pu Cunxin, and all, it appeared to my friend and interpreter, Zhou Yan, and to me, were about lonely men, alienated in someway from the communities around them. During our interview with Lin (2011), he told us excitedly that he had just been in discussion with ‘a man from Edinburgh’. But how would Coriolanus fare when transferred to the Scottish stage, my friend wondered? Would Westerners be able to understand him? Reviews of the Edinburgh production have been mixed, as was my own response to it, but whatever my reservations about some of the nuances of this incarnation, it was certainly a brilliant night’s entertainment. Coriolanus, one of Shakespeare’s most political tragedies – variously interpreted as a critique of the abuse of autocratic power or as a warning against the fickleness of the masses – is an interesting choice for a director who repeatedly insists that he is not political, especially if viewed as part of the triptych of his other Shakespeare appropriations, the aforementioned Hamlet, and Richard III. When Lyn Gardner dismissed the production as ‘offering empty spectacle in the place of nuanced political comment and metaphor’, she was rightly upbraided by a young Chinese woman in the comments below: I think having chosen this play is one brave movement itself. 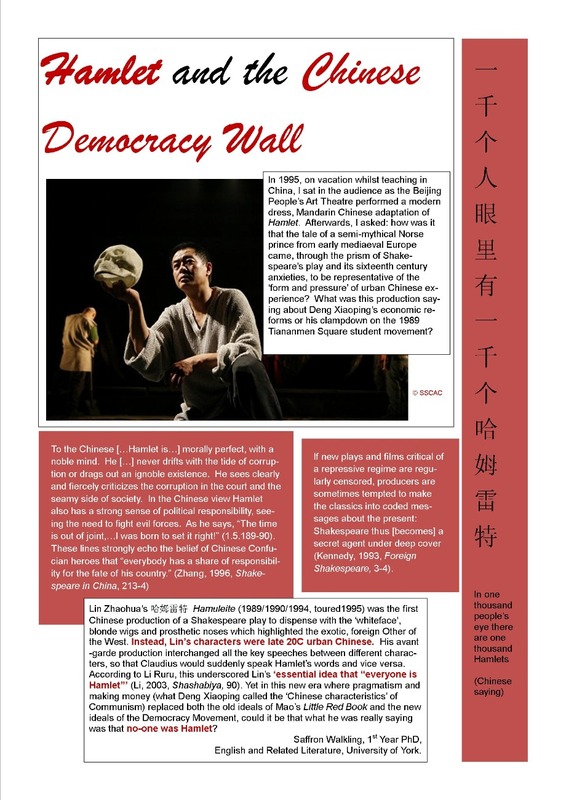 As scholars Li Ruru and Alexa (Alex) Huang have explored in relation to Shakespeare in Mainland China, and Dennis Kennedy has explored in relation to political Shakespeare behind the Iron Curtain, sometimes simply the act of putting on a play is the political comment and metaphor. Lin Zhaohua is a complex case because of his longevity and status – in the 1980s he was the founder of modern Chinese theatre experimentalism, along with self-exiled playwright and Nobel laureate Gao Xinjian, a form that in itself was deeply politically subversive in its rejection of socialist realism, and as a result they faced official criticism and some of their work was banned; yet, as a Beijing intellectual through and through he has chosen to stay in the politically conservative capital city of Beijing (he hails from neighbouring Tianjin) and had formerly risen to the position of BPAT’s vice president. For me, what is often most intriguing is how practioners appear to work within the restraints of the system, yet encode their work with slippery, ambivalent details that to outsiders of that system may seem ‘opaque’ or simply absurd (as opposed to Absurd…). 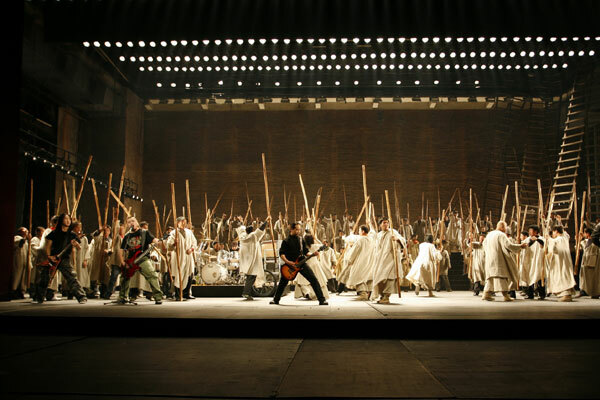 The first, and most talked about, innovation was Lin Zhaohua’s incorporation of two Beijing bands, one heavy metal, the other more indie rock, into BPAT’s production – used not only as incidental music but, as commentators have put it, as a metaphorical battle of the bands between Coriolanus/the Romans and Aufidius/the Volscians. ‘Heavy Rock Coriolanus Turns Up Volume at Edinburgh Festival’ shouted the BBC headline. Andrew Dickson of the Guardian, veteran reviewer of the World Shakespeare Festival and Globe to Globe, loved it, describing it as surprising, gnarly, and as adding ‘volcanic energy’ when the bands Miserable Faith and Suffogated ‘slide in periodically from the wings and punctuate the action with frenzied surges of nu-metal.’ Dominic Cavendish of The Telegraph, in another thoughtful, if not so thoroughly researched, review found it an ‘arresting concept’ evoking ‘China’s tumultuous embrace of Western influences.’ (Gardner showed her disdain by barely mentioning them.) Many reviewers returned to this idea of Western influence in the music. In fact, Brian G Cooper of The Stage complained that in Lin’s Coriolanus, a production transferred from Beijing (unlike the National Theatre of China’s Richard III devised for last year’s Globe to Globe) the ‘uniquely Chinese theatrical influences are conspicuously absent’ throughout. He was perhaps not aware that until very recently Chinese traditional theatre (Beijing Opera etc) and the more recognisable Chinese spoken theatre, originally a western import, have been two distinct traditions – I certainly had no awareness of this until I began researching this area. This got me thinking about the use of music, specifically, the music found in Chinese traditional theatre. These rock bands reminded me of the musicians in Beijing Opera, who often sit onstage, visible to the audience. 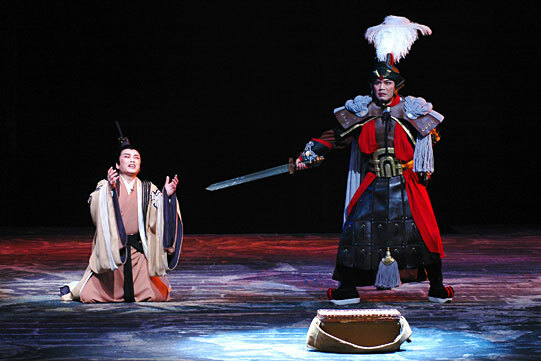 And while British audiences expect lutes and flutes to accompany Shakespeare, Beijing Opera goes for clashing cymbals (if not thrashing guitars) whenever a General or king enters the scene. Could this supposedly Western-style production be rather more Chinese then we give it credit for? And Andrew Dickson was onto something with his reference to nu-metal. Rock music in China has a political heritage. 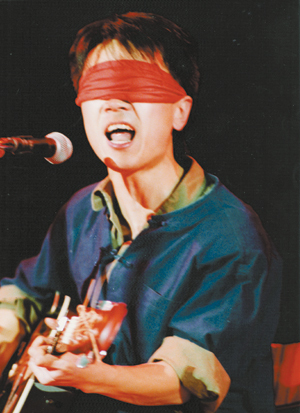 It’s first post-Cultural Revolution, Open Door Policy rock god, Cui Jian, entertained the students in Tiananmen Square, his ‘Nothing to My Name’ becoming part of the soundtrack to the demonstrations. Pu Cunxin’s ‘a bit RSC,’ continued David Schneider, ‘a bit RSC meaning he loves the costume, he loves the swagger, the swish of the cloak and standing with one leg forward and leaning on it’. Tom took it up: ‘It’s a very old kind of actor manager style. Or it looks that way to us. ‘ Ay, there’s the rub. It looks that way to us. Martin Hoyle in the FT saw ‘rhetorical moments’ which found ‘the individual actor caught in an attitude that fleetingly resembles the pose of a Victorian theatrical print or cut-out character for a toy theatre.’ And those fleeting resemblances were certainly there. But that was not all that was there. In the swagger, the swish of the cloak, the fixed postures, were echoes of other generals from other traditions. And with contemporary spoken drama directors in China intent on Sinocizing the form, they were perhaps intentional echoes. Which raises the question, is the problem (if there is a problem) with the production, the place of performance or the unpreparedness of the audience? Does a play lose meaning out of its context? And should we judge it as a failure if we don’t understand it, like Sutcliffe and Gardner, or is it an opportunity to learn, and learn to appreciate a little more about what theatre is, as did so many other reviewers and spectators?